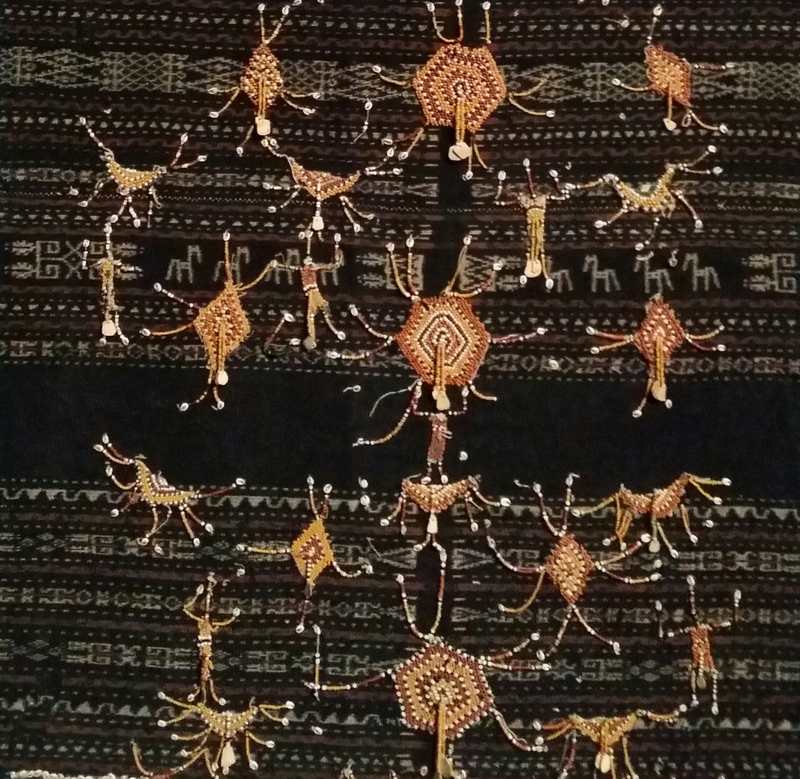 Despite many trips to Laos and Asia in general, my love for things traditional textile-related remains far from sated. 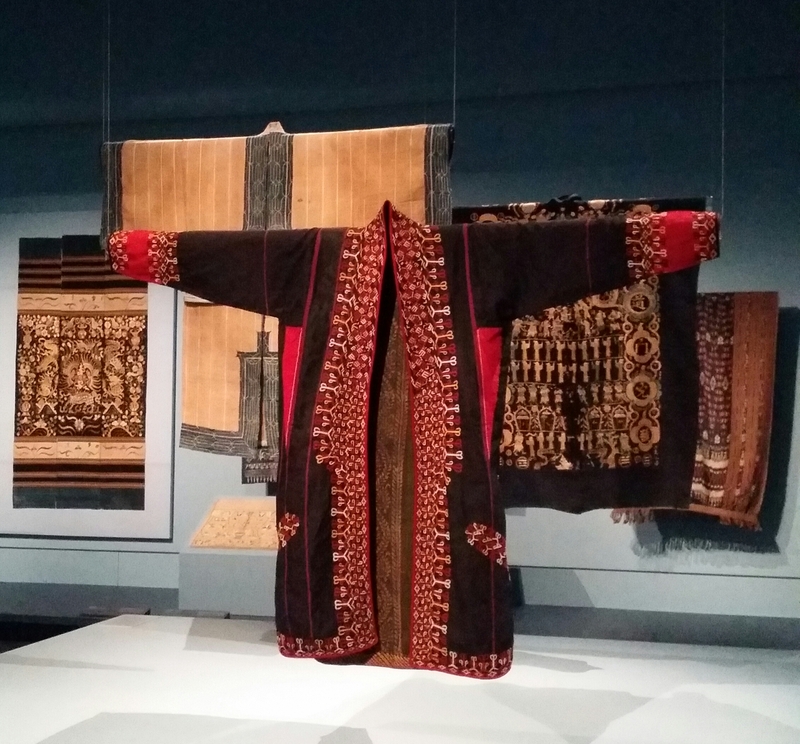 So it was with a sense of excitement that I visited the NGV last week to check out their new (and FREE!) exhibition, Blue: Alchemy of a colour. Strictly speaking, the exhibition is about the colour blue, so there are not only textiles but many ceramic items on display too (think Chinese and Dutch vases, plates and so on). While I do love the blue and white colour combo of these ceramics (proof is in this ancient post I did which features one of my best ever hard rubbish finds) I was more interested in the textiles, most of which are from somewhere in Asia and have been dyed using indigo. 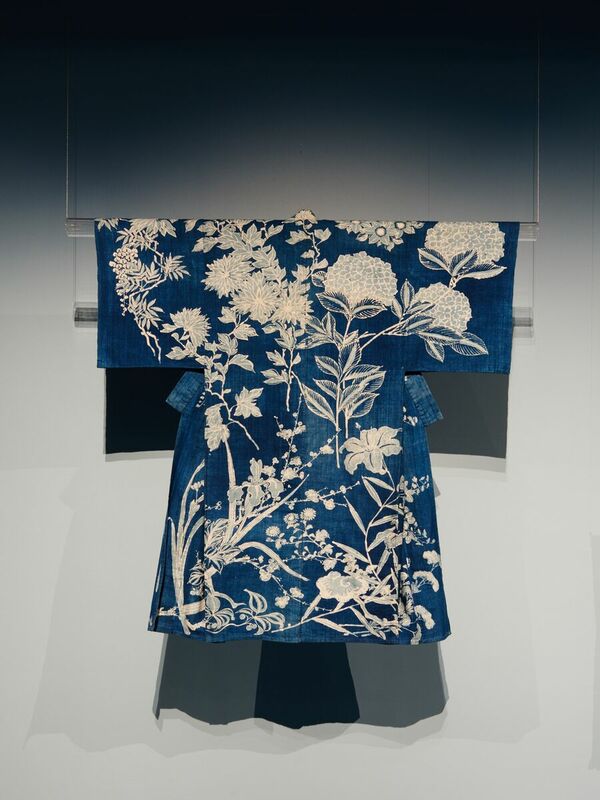 Indigo can create just about any shade of blue – the “alchemy” in the exhibition title refers to the fact that the indigo dye appears green but turns fabric blue once it oxidises, and also that it takes many dips in the dye bath to create strong colours. 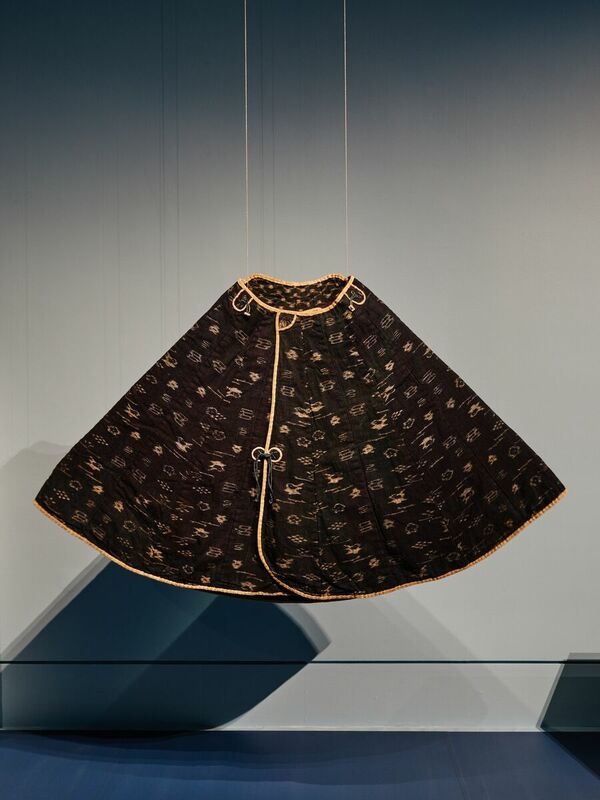 The baby carrier below is by a Chinese ethnic minority and you can see two different blues in it – the pale shade and the very dark navy (fabric can be dyed to a nearly black colour through many, many dippings and dryings). It turns out indigo can also create navy with a brown coppery sheen as seen on this jacket made by the Dong people. I was fascinated to read about the process that creates this effect. It is called calendaring and involves spreading some kind of paste or glue over the surface of the fabric and then pounding it with a mallet! Perhaps not something to try at home. 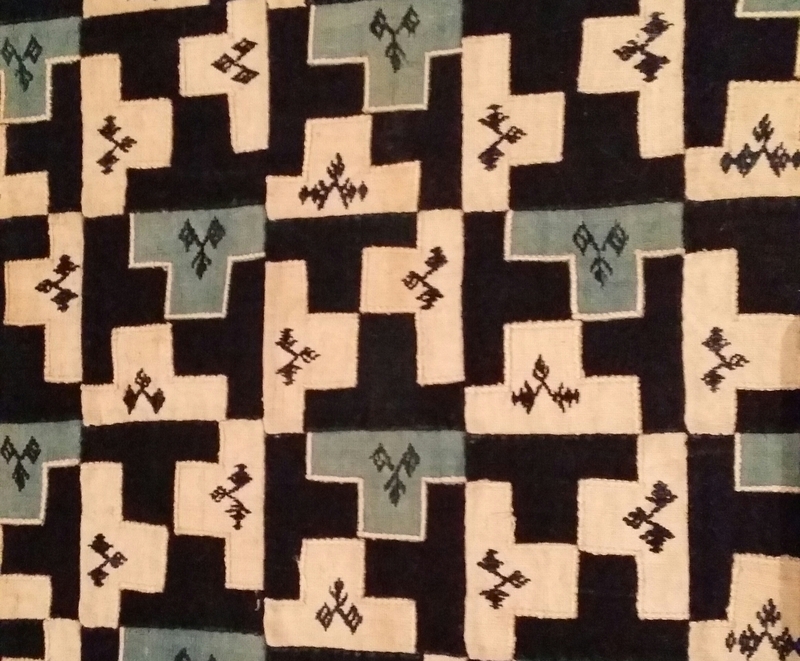 And this (ikat woven?) cape looks far too special for everyday use too. Although I have dabbled very briefly in indigo dyeing (once to make a scarf in Laos, and once in Melbourne to make a dress) I still don’t know much about the process and am regretting I didn’t do any workshops on my recent trip to Laos. The dyeing process is very stinky (indigo dye vats contain fermented indigo leaves) but after the smell fades on the fabric it leaves a fragrance that is just slightly sweet – I love it and would wear it as a perfume if I could (with the added bonus that it keeps insects away)! I’ve still got a bit of indigo dyed organic cotton fabric left over from purchases a few trips ago and I have two metres of some indigo dyed organic silk, so if I can get my act together and actually make something from the fabric, I’ll be able to stage my own personal “blue” exhibition!